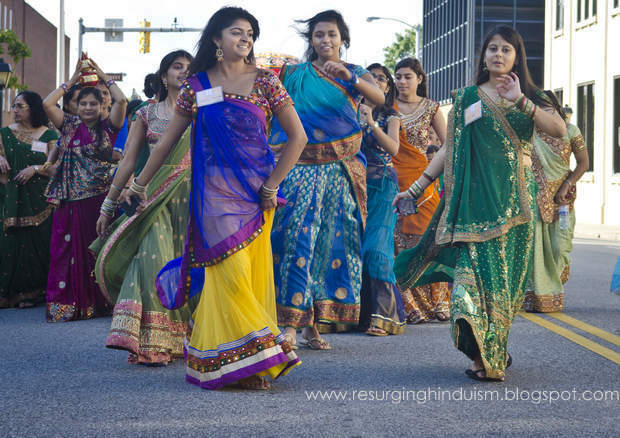 the Roanoke Valley’s Hindu community. 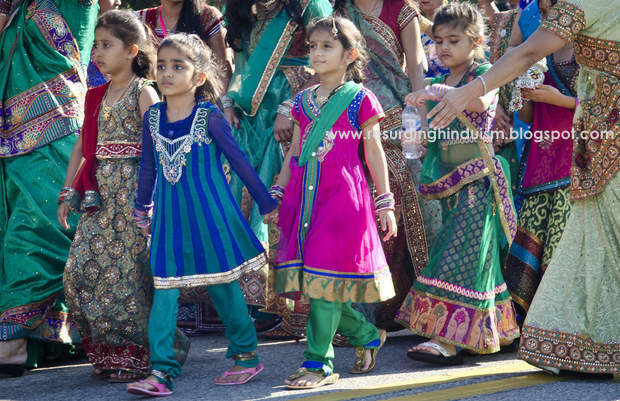 Children danced through the streets of Salem on Sunday morning as the Hindu community celebrated the installation of a new mandir, or Hindu temple. 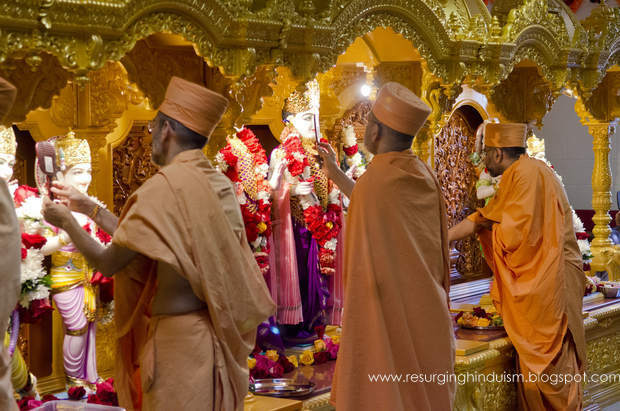 It will be the second such temple in the Roanoke Valley, but the first of the BAPS denomination, in which devotees follow the teachings of Bhagwan Swaminarayan . Religious leaders say the new temple on Sheraton Drive won’t just give them a place to worship, it will serve as a hub for the Roanoke Valley’s Hindu community, which is made up of about 400 families. Dharmendra Patel is an active member of the BAPS denomination and a Salem business owner. He said there aren’t many Indian immigrants in Southwest Virginia, so it can be a challenge for them to maintain their cultural identity. 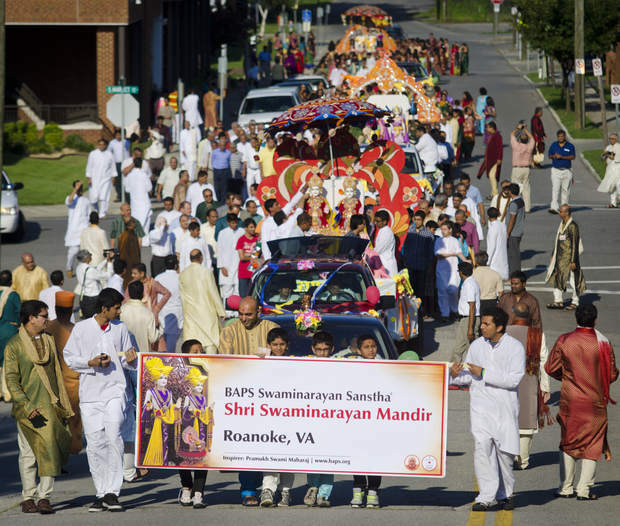 Roanoke’s and Salem’s mayors, Virginia lawmakers, national Hindu leaders and about 800 religious followers traveled from as far away as New Jersey to take part in the centuries-old tradition of installing a new temple. The event began with an early-morning parade through downtown Salem. Floats carried several white marble statues of Hindu deities carved by hand in India. Participants, some dressed in traditional Indian clothes, danced a short loop that started by the court house. A few people came out of shops and houses along the way to watch. Sadhus, or Hindu priests, said the 4-foot-tall marble figurines were made in the image of God. They were carried through the streets so they can be introduced to the city and bless local residents. After the parade, they were taken into the temple and placed in their permanent home at an altar. Hindu followers then filled the room as they prayed and made offerings to God. Most of the ceremony was in Sanskrit, the primary language of Hinduism, but interpreters explained they were inviting deities to enter the idols. By the time they were finished, almost an hour later, God was said to be alive inside the statues. Coming from an Irish Catholic background, Roanoke Mayor David Bowers said he didn’t understand everything he saw on Sunday, but he enjoyed the opportunity to learn about a different religion. Patel said Hindus believe in one god who has been reincarnated in several forms, which were represented by the statues in the parade Sunday morning. Sadhu Yaynavallabh Das, who leads the BAPS sect of Hinduism in North America, said the service may seem awkward to strangers, but its purpose is similar to ones with which non-Hindus are more familiar .